Can you hear me gnocching? SIX months ago I sat, espresso in hand, reading John Cheever on a hillside balcony overlooking the Tyrrhenian Sea, as the sun set on a centuries-old Italian fishing village below. Villa Frescura, Praiano, October 2012. Six days ago I waded through horizontal rain and sub-zero Siberian easterlies to commute to a storm-lashed Dublin city centre. Needless to say the two days couldn’t have been further apart. At the outset at least. Last week witnessed the start of a cold snap which lashed Ireland towards Easter in flurries of snow and icy winds. With a Friday off I had planned to hit Wicklow Mountains, a sub-1000m chain located near Dublin, for a day hike. I’ve spent enough masochistic days in the Irish hills to know the true worth of the word ‘postpone’, though. So I nixed the trip, only to experience vintage mountain weather on the city streets instead. After a couple of sodden chores I still had rain-lashed hours of the day ahead to fill and little idea how to do so. Memory, and how I engage with it, is something I’ll return to in other posts. Put briefly, I’ve found certain senses can bridge the years and return me to a particular time and place. In my 20s music did this. So did certain books. On occasion an aroma or fragrance would. But, until I met my wife, I never really understood how people could recall specific meals, even dishes, and link these to the people they ate with, their lives at that time, their emotions, who they were. 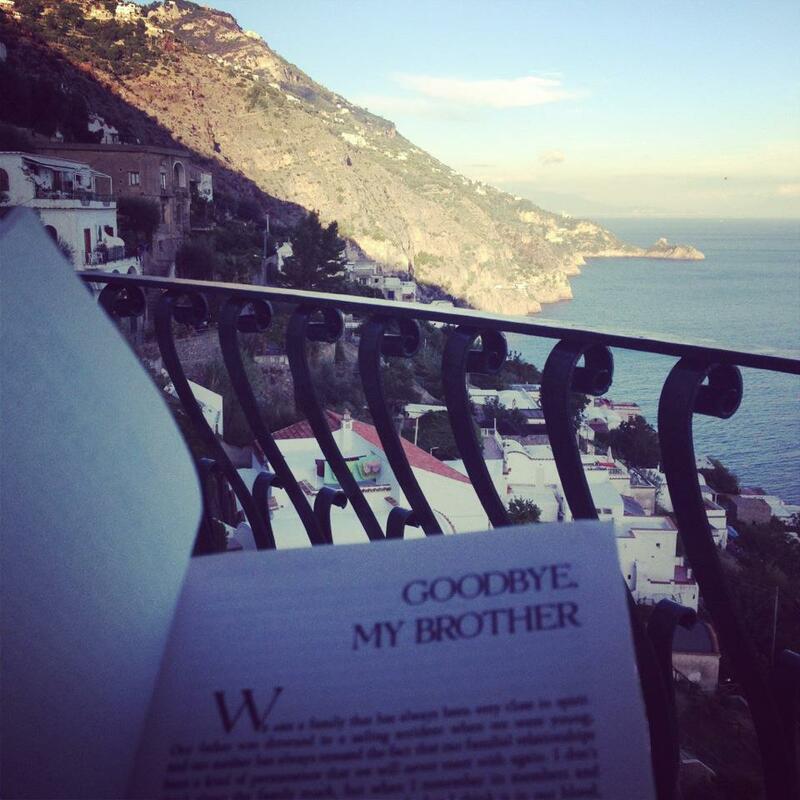 I could have come home, fired up the coffee maker and pulled out ‘Goodbye, My Brother’. And it might have worked. On a roll. Gnocchi coming together. But instead I decided to try it with food. I had spent that blissful afternoon six months ago in Praiano, five miles from Minori, the Amalfi Coast hometown of chef Gennaro Contaldo. An episode of Contaldo’s Two Greedy Italians’ show saw him return to his home town and cook a dish his mother would prepare on the feast day of Saint Andrew, the town’s patron saint. The dish was simple: ricotta dumplings in a tomato and chilli sauce. Nothing, but nothing, speaks ‘comfort’ like these flour-based gnocchi. No better day for it. Getting back to Italy took effort – from wading through the wet streets to measuring zero-zero flour gram by gram. This was my first batch of gnocchi and it wasn’t all smooth rolling. 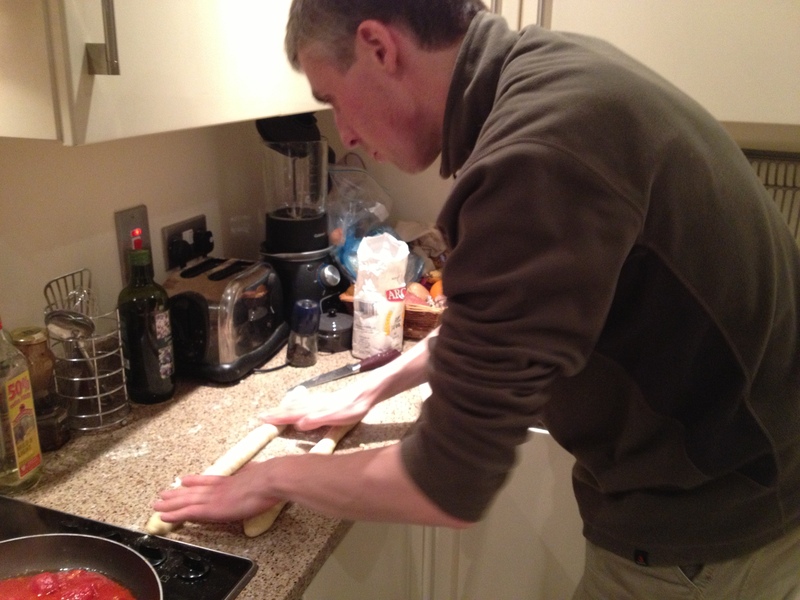 But after a brief wobble and a plea for advice from Clare I got the gluten working. Pretty soon the dumplings were bobbing on the surface, ready to go. But the clincher, and what really returned me to Italy, was the smell of chilli, garlic and tomatoes wafting from the sauce. Here were three simple and inexpensive ingredients that put me right back tableside at any of the half-dozen great meals we had in Praiano. Dublin faded out and the setting was half a world away, my wife and I there again, in the villa on the hill above the sea. Thankful for the memory. An American in Italy, in Ireland. Ricotta dumplings with braesaola salad. I’M not the world’s biggest Beatles’ fan. In fact I’m usually not even the room’s biggest Beatles’ fan. But, 50 years after they erupted onto the 20th Century, they’ve have burrowed deep into parts of my unconsciousness. Just how deep only emerges at certain half-moments. I’m in the midst of doing something and suddenly, like a catchy genie, Paul McCartney steps into my head and launches, unannounced, into Blackbird. Of late such cameos have been occurring between 3 and 5am. And the voice has been John Lennon’s, singing a song he wrote while sleepless at an Indian ashram in 1968. I’ve read that I’m So Tired is either Lennon’s agonised cri die coeur for Yoko Ono, a song which exemplifies his Goons-style humour, or a tortured plea as he battled boredom without booze, drugs or cigarettes. But to me it’s the simple, desperate appeal of a man who, despite fame, wealth and spiritual enlightenment, just can’t get to sleep. Lennon’s reasons might be a little different to my own but his ‘I’d give you anything I got for a little piece of mind’ has occurred to me more than once as I’ve engaged in another night of ceiling watching. 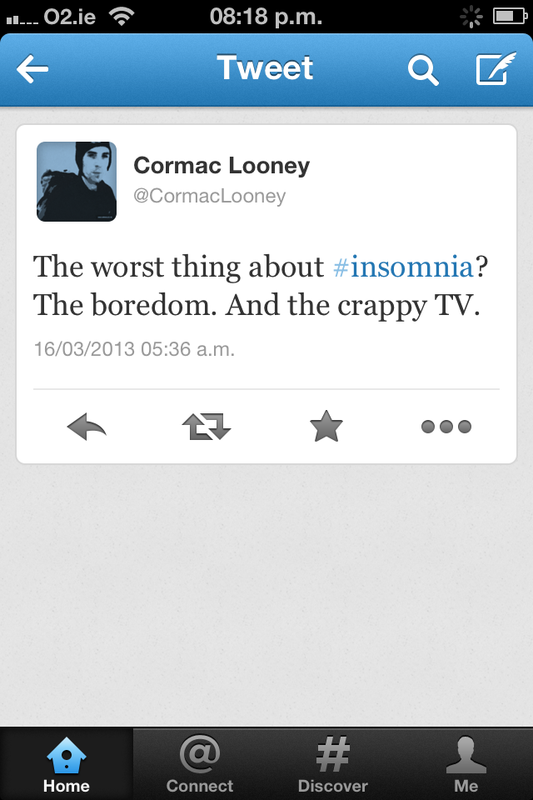 Insomnia’s a senseless condition. My day job, working out and just being around in general usually see me exhausted by 10pm. And yet. Until recently I’ve attributed this sleeplessness to my work. For the past number of years my job has entailed early starts, usually involving a 5am wake-up call, five days a week. I figured this kicked my circadian rhythm out – particularly as it put me in a different timezone to family and friends. As time passed I’ve found other likely causes. I’ve blamed Dublin’s low-light winter murk for disrupting my sleep-wake rhythms. Alcohol, caffeine, late night food, use of electronic devices, loud noises, bad jokes – all these and more have been possible culprits at stages. But the truth is I have no idea why I find myself grappling with insomnia. Not wanting to take sleeping meds every night I now resign myself to hoping that one evening it will simply stop. To tweet, perhaps to dream. There is a silver lining. I’ve watched any number of documentaries and movies that, if I had a regular sleep schedule, I never would have. The same applies to reading books. And I’m able to time my morning runs so I can watch the day break (if I can see the horizon through the rain). I’d rather have Lennon’s “little peace of mind” though, in reality and not echoing around my head as I tinker with the dishwasher at 4am. This week I’ve started new, later, working hours. Perhaps this will have an effect. Here’s hoping. I’m So Tired. Good song but I never want to hear it again, ever. I, on the other hand, can nervously follow recipes, agonising over the vaguer directions while whimpering supplications to the food gods. In the past we have given each other a wide berth in the kitchen, unsurprisingly. Until now. 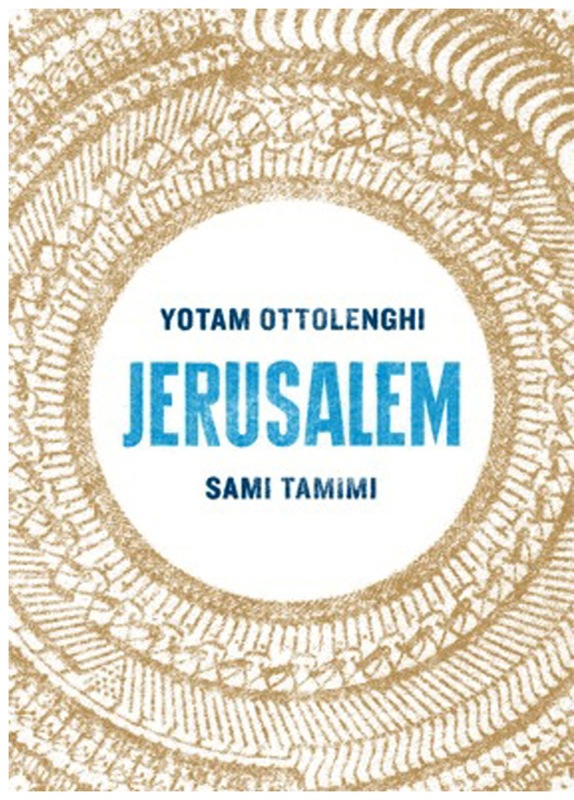 I recently gifted Clare a copy of Jerusalem, Yotam Ottolenghi’s latest cookbook. 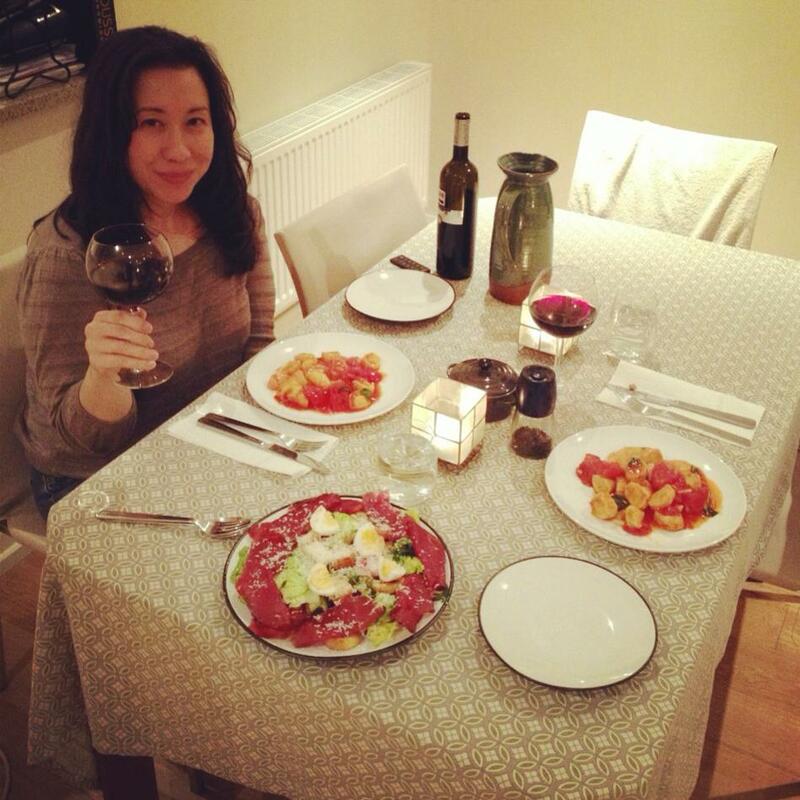 A casual remark that we should try cooking a couple of dishes led to a night’s worth of research and a day’s shopping. Then, before I knew it, I was standing in my pristine apron at the countertop clutching a spatula and feeling like I’d bitten off more than I could chew. Now, I’m not hopeless in front of a burner. I have pulled off one meal in the recent past and I manage to produce edible combos of protein and carbs for myself most weeknights. In the absence of consistent proof I like to think that my culinary talents are merely untapped, as opposed to underwhelming. My underlying fear is that they may be both. Doubts aside, I’d have to pull my weight. My wife, busy with her share of the duties, had no intention of watching over my shoulder as I chopped veg, mashed koftas and tossed some pine nuts into the pan to roast. Not that she needed to. Halfway through I was beginning to enjoy my new role as sous chef, and reckoning I’d cracked the code of Middle Eastern cuisine. 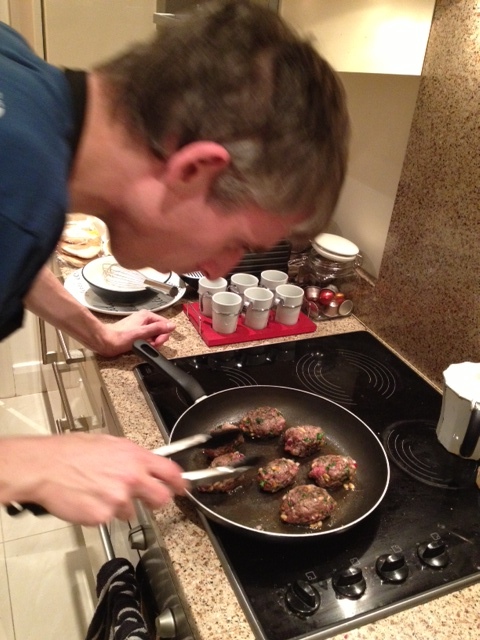 Chef Ottolenghi can rest easy, however. I’m a word fiend, a book hound. As the pine nuts gently roasted I started reading up on the history of za’atar, a spice central to the dish and to Jerusalem itself. The plant (known as hyssop in the West) has been picked in the wild, in the hills surrounding the Old City, for millennia. Its all-pervasive presence is common to both Palestinian and Israeli cuisine. According to Ottolenghi and his co-author Sami Tamimi, its smell “encapsulates the soul” of Jerusalem. By the time I’d learned this much about za’atar another aroma had infested the kitchen, that of burning pine nuts. Ignoring repeated verbal warnings that these little seeds can go from golden to incinerated in seconds I’d spoiled the batch. My wife stood opposite, exercising (with some difficulty) one of her many virtues, patience. 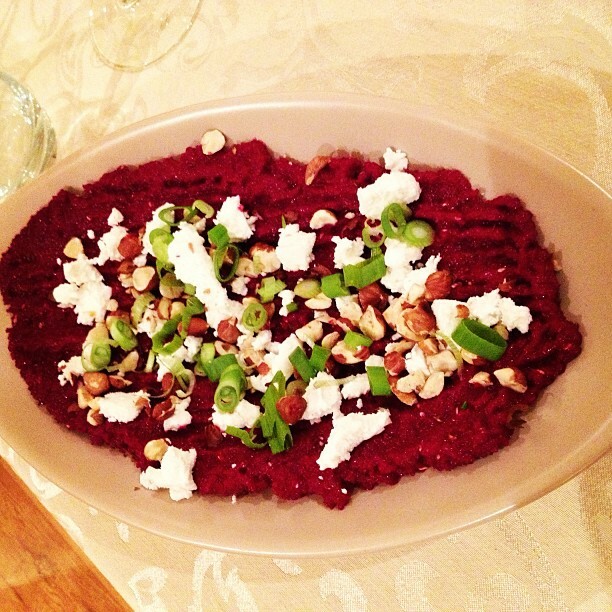 Pureed beetroot with yoghurt and (the all-important) za’atar. Lesson learned, stick to the recipe, not the history. This may be why Paul Child was rarely spotted lingering around chopping onions while his wife was reinventing American cuisine. Luckily my Julia was focusing on the food, making the jewel in the night’s crown – a pureed beetroot with yoghurt and the all-important za’atar (the condiment not the herb alone, in this case). We served it up with kofta b’siniyah (a beef/lamb mix, served with tahini and the take-two pine nuts) and a date and almond salad. What followed was an experience of the aromas and tastes of Jerusalem that no words on a page could conjure. Much of it was down to the spices – cinnamon, nutmeg, allspice, sumac and za’atar. They combined perfectly, no one overwhelming another. A bit like our first joint venture into the kitchen, I’d like to think. Just don’t mention the pine nuts, though. 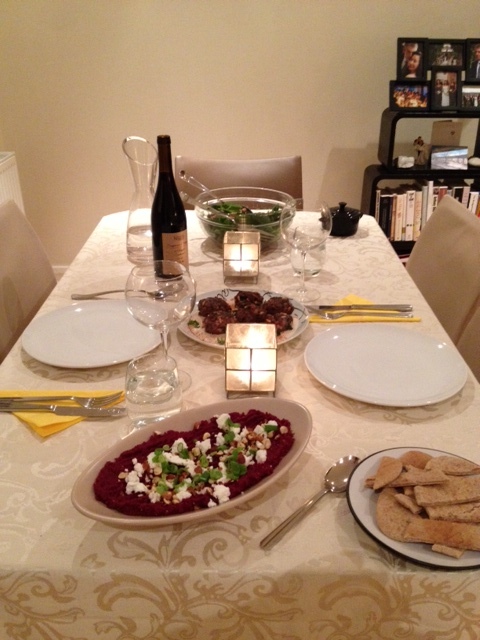 Our Jerusalem feast: pureed beetroot with za’atar, kofta b’siniyah and date and almond salad. Until I reached the age of 30 I had never ran further than 200 metres at any one time. When I did it was at a stretch – one which often involved my hamstring. That changed when I decided to climb Mont Blanc in 2008. I wasn’t fit enough so, one spring evening in that year, I ran five kilometres for the first time. What followed was a reality check of the severest nature, and a gut-wrenching realisation that I had to change the way I lived. So I started running. Almost five years have passed and – allowing for a six month lazy wobble after that Alpine trip – I am still going. Five times a week, regardless of weather, location, state of mind, tiredness or any other factor that conspires to trip me up. Most of it happens in my hometown of Dublin, but sometimes it’s further afield. In the past two years I’ve pounded pavements and parks in Los Angeles and London, New York and San Francisco, Killarney and Tuscany. I’ve run on the morning of my wedding and the nights when jetlag ruled out sleep in Manhattan. My first thoughts on hitting any new place are a little like George Clooney’s secret agent in Burn After Reading. I’ve done most of those runs in my Nike Zooms (above). And this week, after two and a half years, they’ve finally began to fall apart. 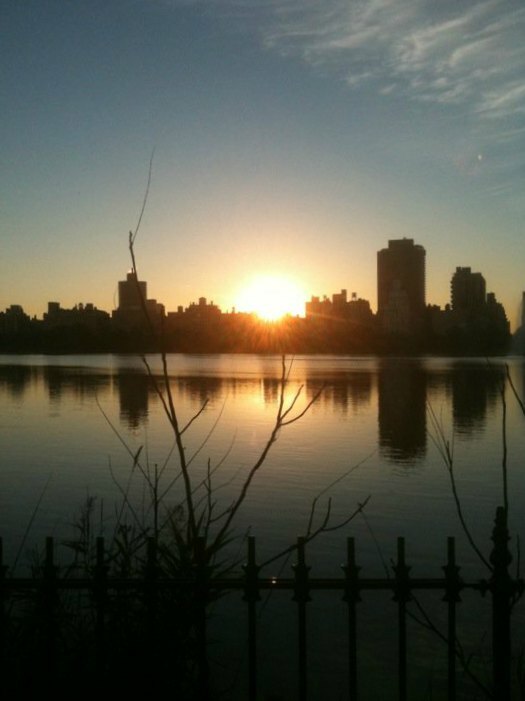 Dawn run, Central Park, 2010. I estimate I’ve clocked up around 5,000km in these runners since I bought them, a stat which would horrify most orthopaedic surgeons. 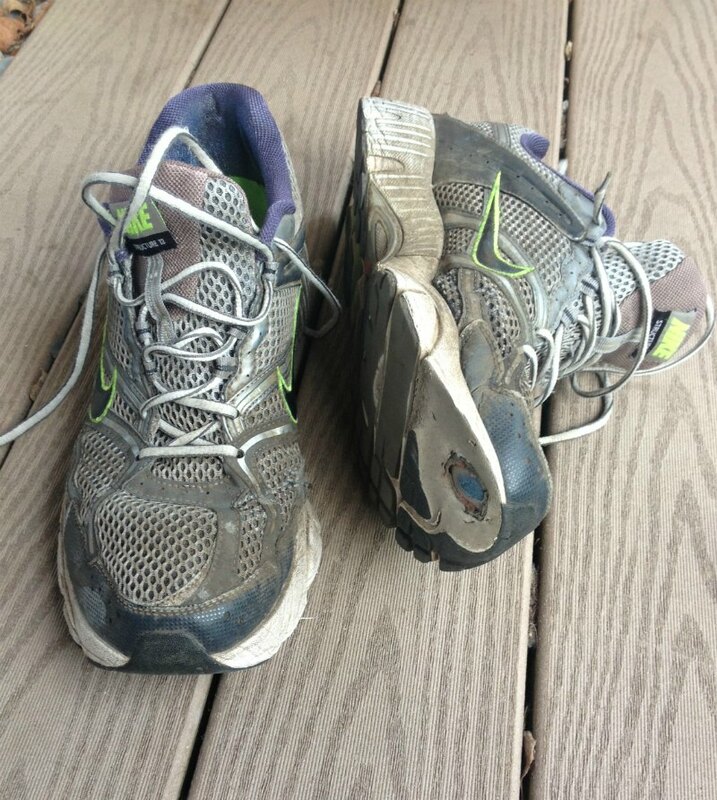 (Common advice is to change running shoes every 700km, I’ve discovered.) For the record over all that time I’ve lost four or five days to shin splints, but suffered no other injury. Despite the crumbling soles, the ripped fabric and the ratty laces even at this late stage I am loathe to bin my shoes. They’re a beat-up symbol of how far I’ve come. But now they gotta go.